Logs and wood debris flowing down a river in Malaysia have blocked river transport and are threatening major flooding downstream. The town of Kapit on the Rajang River in Sarawak has already been cut off, state media reported. Heavy rains have forced millions of cut logs at a timber depot into the river. The combination of a heavy monsoon season with extensive logging, both legal and illegal, is creating a dangerous situation, local media said. 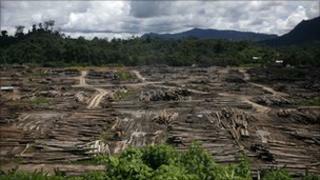 A major environmental disaster was unfolding in Sarawak, which is heavily forested and logged, The Star newspaper reported. The newspaper said heavy rains are believed to have caused a flood at a logging camp on the upper reaches of Balleh River - a tributary of the Rajang - prompting the surge of large logs into the river. The paper quoted a local businessman as saying that the events were unprecedented. A Sarawak blog, Hornbill Unleashed, carried pictures of the log jam and demanded action from the government for better infrastructure in the state. "The chief minister who is in charge of issuing logging licences for the last 30 years should be held responsible," says Hornbill Unleashed in its posting. The river is the only means of transport for communities in the area and residents further downstream are writing blog and twitter entries expressing fear at what might happen when the log train reaches them.